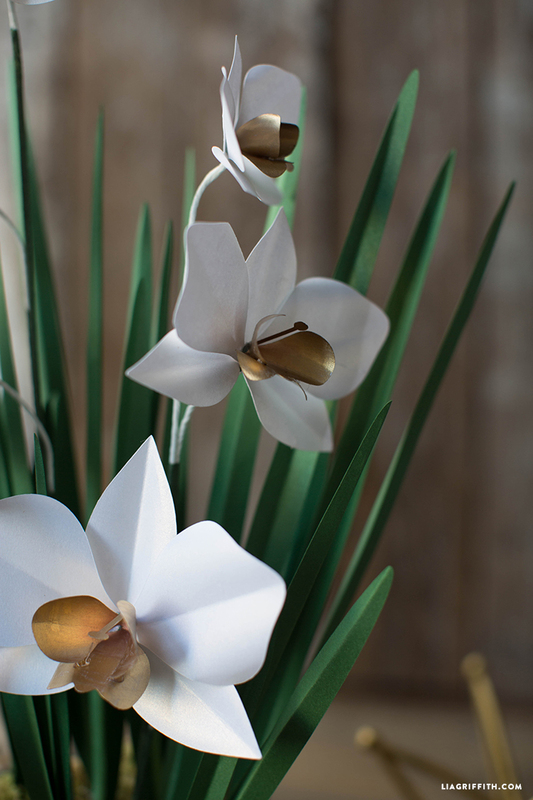 The orchid is a show stopping bloom and one that I have wanted to make yet another in paper for the longest time. 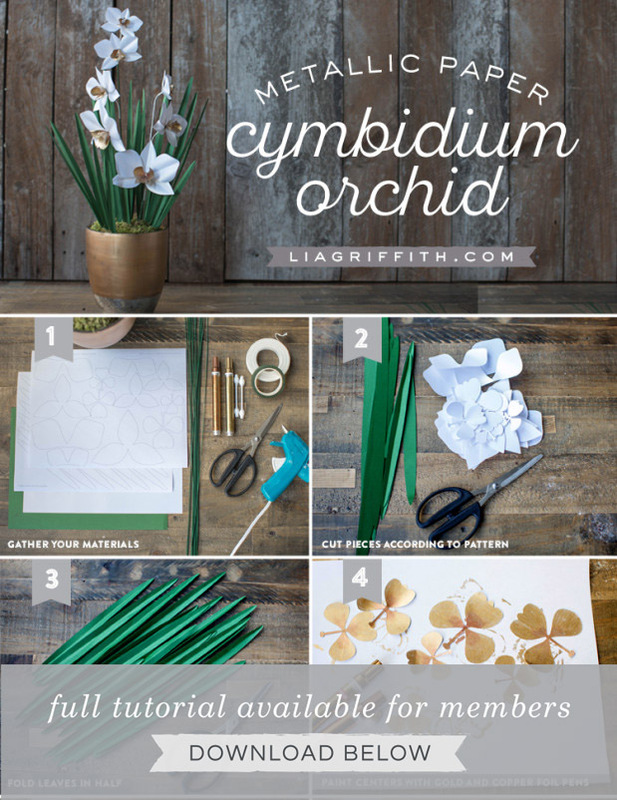 You can find my dendrobium paper orchid in this post and my phalaenopsis orchid pattern and tutorial here. 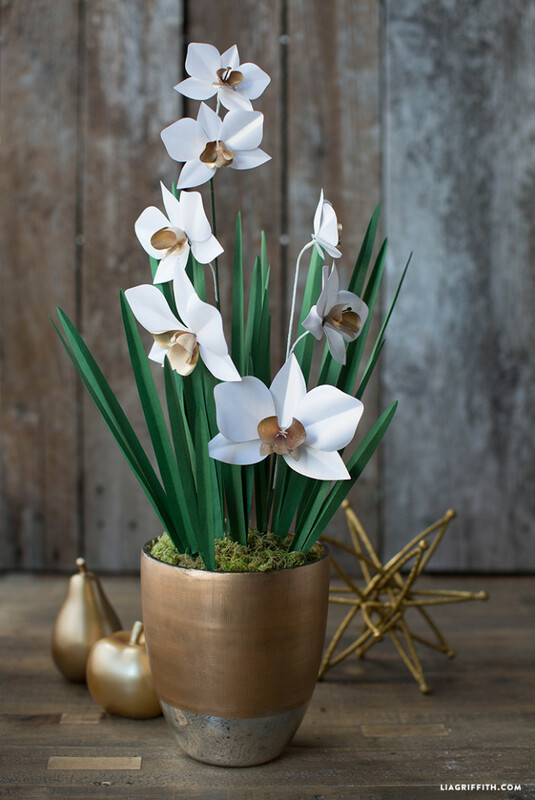 With my paper orchid design, I decided to create a potted version that would make a gorgeous gift or to grace my winter table scape. The plant design itself is made of seven blooms, three on one stem and four on the other. They vary in size as they climb the stem, and are surrounded by a flurry of long, luscious paper leaves in a deep metallic green. 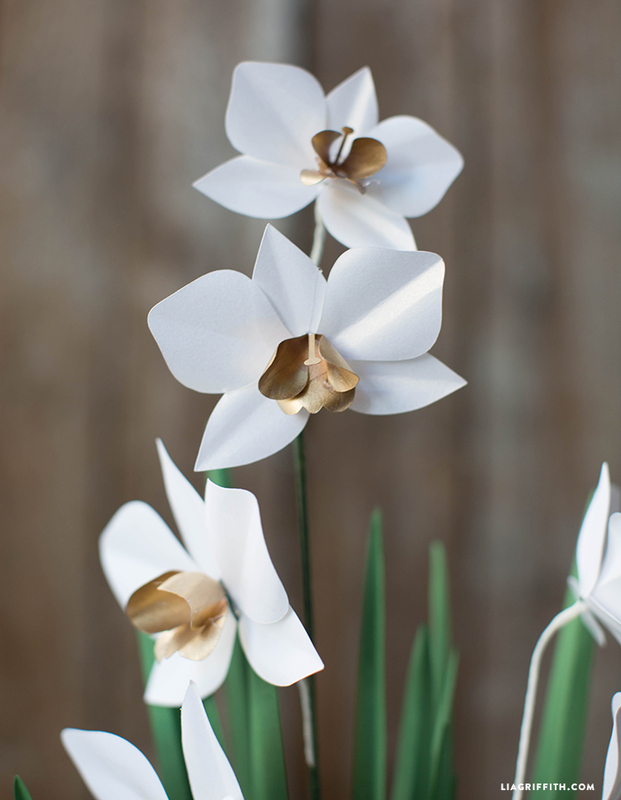 To make this paper orchid, begin by downloading the flower pattern below. If you have a cutting machine you can click on the SVG, and if you will be cutting by hand then download the PDF and print the templates. I used a text weight metallic paper in Ice Gold to make the petals and added color to the center pieces with a gold and copper foil pen. The leaves were made from metallic Botanic green, also in text weight. Hi Lia, love all of your work. I was just wondering if you ship the stuff sold in your shop to outside the US as I live in the UK? We’re hoping to ship to the UK one of these days but in the meantime, Amazon UK and Create and Craft UK carries some of our crepe paper! I was actually looking at the flower kits, is there any way of ordering those to the UK? I got the kit for these, and am so pleased with the results. I’ve created two potted arrangements that I’ll be gifting for Christmas. I’m perusing now for my next project! Love this site!!! Nice to see you hard works, I love to make paper flowers and it’s my hobbies as well, I even sell bouque or flowers for some occasions but I use my own templates for that. My question is if I use you template and make flowers would that be a problem for you if I sell those flowers? Hi Khalidha, we’ve sent you an email to address your question! Thank you for your wonderful work. Do you by any chance have templates and instructions for a Sweetpea flower? Lia, love all your paper flowers. I especially the orchids. Tried to print this out but it cuts off the outline of the leaves even when I remove check from the fit to page box. Any suggestions on how to fix that? Hi Angela! It must be your print margins– some printers cut off more around the border than others. You might have to free hand cut those parts of the leaves, I’m sorry! You could keep the “fit to page” box checked and your result would just be slightly smaller than the original.